When you are thinking about black bear attacks, consider that humans and black bears have been co-existing for thousands of years. If you encounter a black bear in the woods, consider yourself lucky! They are magnificent animals and great teachers. In the extremely unlikely circumstance that you encounter an aggressive black bear, here are some things to keep in mind. Stay calm and avoid direct eye contact. Try to stay upwind so the bear can smell you and identify you as a human. Stand up, talk to the bear and wave your hands above your head. Do not approach the bear, especially if cubs are present. If you do come upon a bear always make sure the bear has an escape route; avoid making it feel cornered. If you cannot safely move away from the bear and the bear does not leave, try to scare it away by clapping your hands, yelling or throwing stones. If the black bear attacks, fight back aggressively. Only as a last resort should you curl into a ball and play dead. The most common reason a black bear attacks is because it became habituated to humans. This happens when people leave trash out and the bears learn to visit these places for an easy meal. In order to avoid this scenario and to protect the bears (by ensuring they do not need to be euthanized) always keep your camp clean, put your garbage in wildlife-resistant containers, store food in double plastic bags and when possible, place the bags in your vehicle’s trunk. When you are camping in bear country always sleep at least 100 yards from your cooking area and your food storage area. Never store food in your tent – hang it in a backpack from the branch of a tree, at least 10 feet off the ground and 4 feet from the trunk of the tree. Regarding thoughts about black bear attacks, I’ll recommend an excerpt from a wonderful book about black bears called “Walking with Bears” by Terry D. DeBruyn, Ph.D. In this book the author and biologist followed several generations of black bears around through the woods and recorded everything they did. In this story, he records the bears’ behavior when they encountered other people in the woods. “Only twice, when I was present, have the bears ever encountered other people. Bears’ senses are acute, and while I cannot be certain, I suspect that most often they are able to steer clear of such encounters well in advance. On the first occurrence, I was with Carmen and Corduroy and Aster, then cubs, on a nice, quiet day in early May. We were resting in an aspen stand next to an opening in the forest. The cubs slept partway up a medium-sized cedar tree about ten feet from the edge of the opening. Carmen, lying on the ground between me and the cubs, was about fifteen yards distant. The cubs were about ten yards beyond her. Suddenly, Carmen sat alert, her ears perked. After holding the position a few moments, she walked over to the cub-tree and huffed to the cubs, sending them higher up the tree. Then she returned to where she had been and resumed sitting alert. I thought another bear was coming, which was not unusual, but I could see or hear none. We sat awhile. Then, on the other side of the clearing, I saw something tawny-brown moving – I thought it might be the flank of a deer. Casually, Carmen walked off about fifty yards behind me (away from the cubs and the clearing) and lay down. She remained very alert, looking toward the opening. It was then that I recognized the tawny-brown movement as that of the legs of a man dressed in khaki pants. He walked directly toward the cubs and me, right along the edge of the opening, coming within fifteen feet of the cubs. The cubs were quiet, and Carmen did not make a move. The man walked right on by, oblivious of the bears. About half an hour later, Carmen remained in her alert resting position. I turned to watch the cubs, now asleep in the top of the cedar, and thought, “Come on, Carmen, he’s gone. Let’s go do some bear stuff,” when I heard brush breaking about fifty yards away. A quick check revealed Carmen had not moved. She was still lying there watching in an alert position. Then I heard a man’s voice: “Honey, where are you?” A woman’s voice responded, “Over here, dear.” The man then proceeded to walk right between me and the cubs. I crouched behind the windblown stump that I had previously had my back against. For some reason, it was all I could do to keep from laughing. The man passed only ten yards from the cubs and never had a clue they were there. Some of the best ways to avoid potential black bear attacks is to gain a deeper understanding of the lives of these bears and also to prevent them from accessing food. If you live in black bear country or are camping in black bear country, please make sure your food is properly stored in bear-proof containers. Many campgrounds provide these at each site in areas that are frequented by bears. Getting to know the true nature of bears takes time, but is certainly vital in helping avoid black bear attacks. The resources mentioned in this article are a good place to start. There are excellent books available out there on black bear natural history and behavior. It can be a great aid to know how to recognize their tracks and sign. Here is an article that introduces the basics of black bear tracks & sign: American Black Bear Tracks & Sign. Using tracking knowledge and being able to recognize areas that are being currently heavily utilized for food, shelter or other needs by these animals provides us an opportunity to respectfully avoid them. This can also help us avoid the potential of black bear attacks. 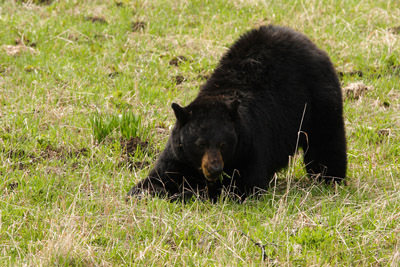 For more information on how to prevent a black bear attacks check out this article from The Smithsonian.